A new family of caecilians, the most enigmatic branch of the amphibians, has been discovered in northeastern India. The animals, which at first glance resemble worms, live in forest soil and are most closely related to an African group of caecilians. "Caecilians are the most cryptic group of animals, and it's not possible to identify whether it's a new species or genus or family just after collecting it," said SD Biju from the University of Delhi, who led the project. "We studied the molecules (DNA) and the morphology, both internal and external, to identify the species," he told BBC News. Unlike the familar frogs and salamanders, caecilians are limbless and smooth. Reproduction and rearing of the young are varied. 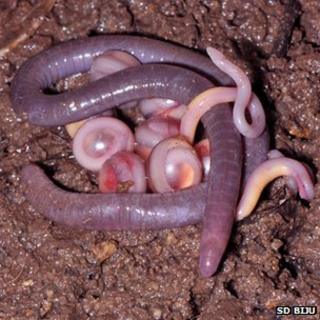 The most unusual known example is a species where the babies eat the mother's skin, which she sheds for the purpose. Chikilidae'shabits are not quite so spectacular, though the mothers stay wrapped around their developing eggs for 2-3 months at a time, apparently not eating at all during this period. Although Chikilidae turned up in about a quarter of the survey sites and so might be quite abundant, Prof Biju believes its future is not assured. "We found them not only in the forest area but also very close to human settlement," he said. "So conservation of this group is extremely challenging." Globally, amphibians are the most threatened group of animals, with about 40% of species on the internationally-recognised Red List. Prof Biju has been involved in discovering scores of other new amphibian species in India, where he has been dubbed "FrogMan".